Seven (7) nights accommodation in a mixture of 3 - 4 * accommodation (hotels, inns and guest houses). Eight (8) day Freedom of Scotland Travel Pass including handling fee and postage within the UK (train tickets are delivered to first hotel in Edinburgh). Tickets are based on standard class (valid on all trains except for travel before 9:15 am Monday - Friday, with exception of trains between Glasgow-Oban/ Fort William/Mallaig and Inverness- Kyle/Wick/Thurso). NOT valid on the Jacobite Steam Train service between Mallaig- Fort William. Breakfast daily, except for morning of arrival (Scottish or continental depending on the accommodations booked). Caledonian MacBrayne ferry from Armadale to Mallaig (voucher included in travel pack received at first hotel). All service charges and hotel taxes. Clients might find that not all hotel accommodation booked are within walking distance from the station, comfortable to them. We recommend that all accommodation location is checked by the client in advance of their travel. Clients are responsible for their own transport to the hotel, where required. It is the clients responsibility to ensure timely arrival at the stations to not miss trains. In some location there may be no alternative and any program changes and resulting charges from missed trains will be charged in full to the client. Tour start date must be Sun, Mon, Tues, Fri or Sat. This is due to limitations on Skye - Wed/Thurs start dates must be avoided. Arrival in Edinburgh. Make your way to your Edinburgh hotel (unless optional transfer was booked). Spend the rest of the day to visit some of the capitals tourist attractions, such as Edinburgh Castle, Royal Yacht Britannia, and the Scotch Whiskey Heritage Centre. Overnight in Edinburgh. Make your way to the train station to catch the train to Perth. 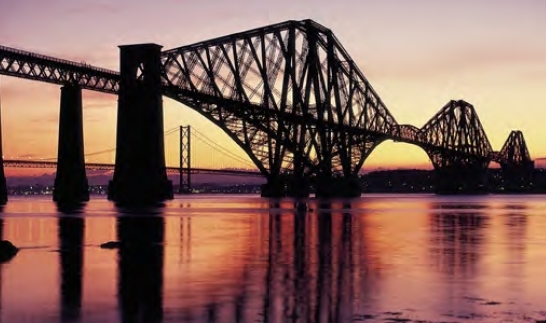 This service leaves Edinburgh across the Forth Estuary, traveling on the famous Forth Rail Bridge. During your journey you will see beautiful coastal and inland scenery. On arrival in Perth, *free time for sightseeing of this small market town which was once the capital city of Scotland. With accommodation in Pitlochry, jump back on the train and make the short journey to this charming highland town, the gateway to the highlands. Overnight in Pitlochry. Although there is free time in Perth, unfortunately the Perth Rail Station does not offer lockers for luggage. You would need to keep your luggage with you during this time. Today take a morning train to Inverness and spend the afternoon exploring the city they call capital of the Highlands. Take a stroll to Inverness Castle, currently used as a courthouse. Enjoy the fine circular walk from the castle along the river and through the Ness Islands. Time permitting take the free shuttle bus from the Tourist Information center at Bridge Street, which takes you to Loch Ness pier. From here you can take a boat trip on this famous loch, best known for its fabled Loch Ness Monster. Overnight in the Inverness area. Today take the train for the 2 hours 40 minutes journey to Kyle of Lochalsh on the West coast of Scotland along this most scenic railway! Arrive at Kyle of Lochalsh and board the local bus service, which will take you across Skye Bridge and onto the Isle of Skye or the misty isle as it is called. Overnight on Isle of Skye. Free day for exploring the Isle of Skye. Visit can include the Clan Donald Centre near Armadale, or if you'd like to venture further why not hire bicycles to explore the rest of the island? Overnight on Isle of Skye. Using your freedom pass, utilize local bus service to take you to Armadale. You will catch the ferry from Armadale to Mallaig; back on the mainland. This beautiful little town is the gateway to the Western Isles. In the afternoon board the train to Fort William, on the route described as one of the great railway journeys. Overnight Fort William/ Corpach. Depart in the morning by train to Glasgow. In the afternoon spend some time discovering this vibrant and stylish city, with its various galleries and shops. The open top bus tour is highly recommended as it will take you round the main sights. Overnight in Glasgow. Today you will leave Glasgow by train and return to Edinburgh for departure home. You may also opt to remain in Glasgow. PLEASE NOTE: This tour is designed for the "Independent" traveler. This tour does not offer any guides or assitance at rail stations. You are on your own to to find your way to each rail station and each train. Addtionally, you may find that not all hotel accommodation booked is within walking distance, comfortable for you, where a taxi will be needed (not included). We recommend that all accommodation location is checked by you in advance of your travel. You are responsible for your own transport to the hotel, where required. Prices are based on two (2) passengers sharing a twin/double room. If a single room is booked, single supplement applies. Triple rooms offer discounts. Scotland by Train is designed for the Independent Traveler! Hotel accommodations will be advised on our suppliers confirmation. Freedom of Scotland Travel Pass will be waiting at your first hotel in Edinburgh. Departure date is the date one would start touring in the UK including any pre/post nights. Does not include air travel.